We make it great in the Sunshine State, 1979. Christmas card sent to constituents of Yeronga, in suburban Brisbane, 1979, from Norm Lee, Minister for Industry and Administrative Services, and Liberal Party Member for Yeronga (1964-89). The Sunshine State, 1959. Official theme song of the Queensland Centenary Celebrations. Great state. Great opportunity. 2012. Queensland Government slogan, 2012. Queensland Government logo, 2012. Corporate logo designed by the Newman government after it won office in 2012, replacing the Beattie-era logo on government publications and websites. 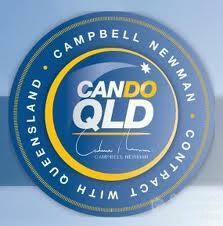 Can do Qld, 2012. The Liberal National Party offered a ‘contract with Queensland’ during the State election campaign in 2012. Toward Q2: Tomorrow’s Queensland, 2008. Queensland Government slogan, 2008.